$100 million production at the Kodak Theatre in Hollywood in 2010. The unnamed show would focus on Hollywood’s role in the history of film, the release announced. Seventy-five performers will put on the show 368 times a year as part of a 10-year agreement between Cirque du Soleil and the CIM Group, which owns the Hollywood & Highland Center where the Kodak Theatre is located. The $100 million project includes modifications to the showroom’s configuration costing about $60 million, and a production featuring 75 artists. The show would be directed by France’s Philippe Decouflé, who directed the Albertville Olympic Games opening and closing ceremonies in 1992. The Los Angeles city government is stepping in to help save plans for a reconstruction of the Kodak Theatre so the home of the Oscars can accommodate Cirque du Soleil's 10-year Hollywood-themed show. L.A. developer CIM Group, which co-owns and operates the Kodak at Hollywood & Highland, is seeking a $30 million loan from the city to replace a private financing deal that collapsed in the capital market meltdown. Under the deal, the city essentially would borrow $30 million from the U.S. Department of Housing and Urban Development and then loan that money to CIM for the project. It carries some risk to the city. If the Cirque show tanks or otherwise is unable to pay, then CIM is obligated to pay. But if it can't, the city would lose up to $30 million of HUD money. Already, design changes have forced a delay of at least nine months in the project's opening, pushing it back to summer 2011 from the September 2010 opening date originally announced. The major change has involved fitting an on-site training center for Cirque performers into the existing complex. A month later the loan situation would be resolved. A five-member committee of the Los Angeles City Council voted to move ahead with the $30 million loan to bring a decade of Cirque du Soleil performances to the Kodak Theater in Hollywood. The council’s Housing, Community and Economic Development Committee unanimously forwarded the loan proposal to the full council for a vote, saying the deal would boost the economy by drawing tourists to the Hollywood & Highland shopping mall, where the theater is located. Under the proposed loan agreement, TheatreDreams LA/CHI (a joint venture with CIM/H&H Retail, LP, which operates the Kodak Theater and the Legendary Chicago Theater) would promise to create no fewer than 858 jobs and stage the acrobatic show 368 times per year. It doesn't matter, says James Hadley, senior artistic director for Cirque's North American shows. "Our biggest challenge is not about diluting the brand," Hadley said as he stood in the shade watching his performers go onstage at the Grove. "It's letting people know each show is different. People see Cirque du Soleil once and think, 'Well, I can cross that off my list.' One of the reasons we came to the Grove is to show how different each show is." On Sunday afternoon, performers from each of the six Vegas shows performed an excerpt from their shows. The Kodak Theatre show would be new and centered on a history of the movies -- as befits the Hollywood location. And referring to the legendary story of Laliberté's gamble on Los Angeles in 1987, he said, "now to come back to Los Angeles is just a wonderful way to complete the circle." 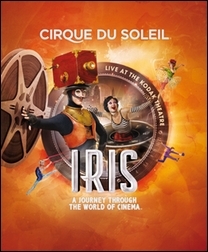 On September 22, 2010, Cirque du Soleil officially announced IRIS to the world, a year later performances would begin and the show was up and running. 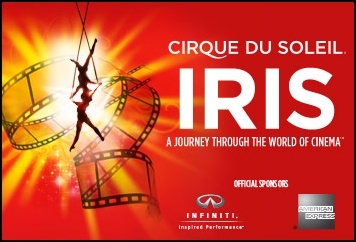 After close to 500 well-received shows at the world renowned Dolby Theatre, the last performance of IRIS by Cirque du Soleil will be January 19, 2013. Despite phenomenal reviews and enthusiastic audience response, demand has not met projections. We have been honored to work with both the City of Los Angeles and the CIM Group to launch IRIS at this iconic location. It has been a joy to stage IRIS in the beautiful state-of-the-art Dolby Theatre and we appreciate the wonderful relationships we have built in Los Angeles. For the time being, we will redeploy as many as our artists and employees to other Cirque du Soleil projects. Performances of IRIS from 20 January through 26 January have been canceled. Any customer who has purchased tickets for these performances, please return to your point of sale for a refund or exchange into another performance. Indeed the LA Times asked in the wake of the shocking news: why did the show fail? Their answer: IRIS just failed to ignite the passions and imagination of the Los Angeles populace. 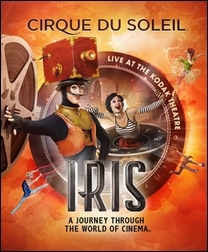 Danny Elfman, who composed the music for “Iris,” said in an interview that he had expected the show to run “at least to the summer,” after which Cirque would make a decision whether or not to continue. “Everyone knew that the attendance was not up,” Elfman said. The Oscar-nominated composer, who lives in Los Angeles, said he was extremely happy with the show from an artistic point of view, but said that he was disappointed by the lack of general public awareness. “After a year of advertising, the fact that most people I ran in to had no knowledge of it being there says it all. It wasn’t able to get into the general consciousness,” Elfman said. Cirque officials declined requests for comment. They also declined to provide box-office figures. At one point the top ticket price of $253 was a record high in Los Angeles. Company officials said that they expected Southern California residents to drive attendance in the first two years of the shows run, and that then tourist interest would pick up, according to Gubler. But that obviously has not happened. Michael Ritchie, the head of Center Theatre Group, said that tourists who come to L.A. don’t usually put theater-going on their itineraries. 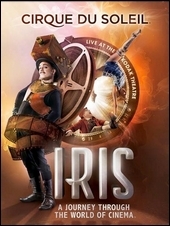 It is unfortunate that IRIS did not have the opportunity to work out the kinks in its cog and mature into one of the Cirque’s classic productions. But in amongst the uncertainty, the cast kept their head up: celebrating their 500th performance on December 9, 2012 in style. Will IRIS surface again in the future? Only time will tell. All that we know is that artists who did wish to continue their careers with Cirque du Soleil were offered all available spaces in other productions, and those who didn’t lined up new opportunities elsewhere.